In order to properly talk about this show, we of course need some historical context. The history of professional wrestling of the kind we most commonly recognise can be traced back to at least the 1830s in France. There is, of course, a difference between the competitive sport of wrestling and “pro wrestling”, and this is where the distinction really began to be made: Circus sideshows would feature strongmen acts who could also wrestle (acts with positively delightful names like Edward the Steel Eater and Gustave d'Avignon the Bone-Wrecker), and would challenge members of the audience to try and take them to the mat. After a decade or so, these acts became popular enough to headline circus troupes of their own, with the first such all-wrestling troupe appearing in 1848 presented by Jean Exbroyat. It was Exbroyat's troupe that first introduced the rule that holds were only valid if executed above the waist, eventually evolving into that most famous of combat sport phrases “no rough stuff; no striking below the belt”. In Europe, this style became known by the famous moniker “Greco-Roman Wrestling”. 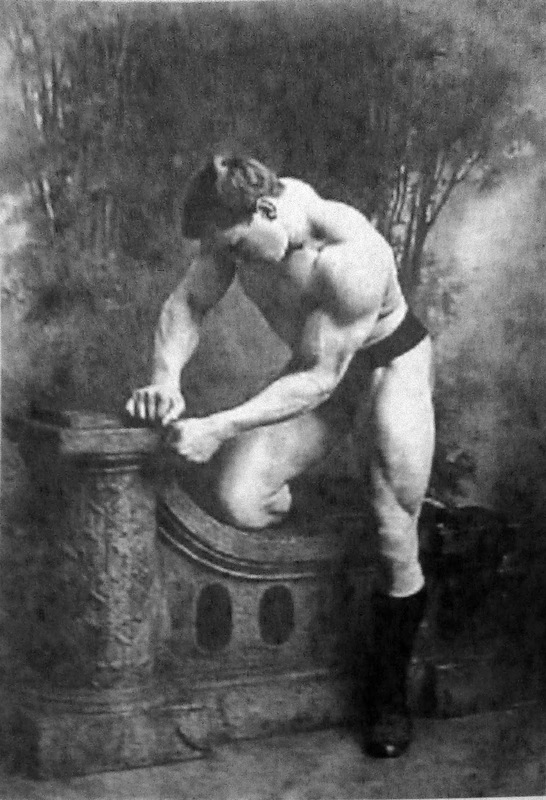 Georg Hackenschmidt, early crossover performer. But it was in the early 20th century where professional wrestling truly began to crystallize into its most famous form. And, as is the case for much entertainment in the United States and United Kingdom, it has a strong connection to Vaudeville, Burlesque and Music Hall culture. Looking for new twists on the strongmen acts in their variety shows, presenters would offer challenges to the audience to last a specified amount of time grappling with the performers, much as had been done in France in the 1830s. When Greco-Roman wrestler Georg Hackenschmidt travelled to the UK and teamed up with a local promoter to take on a series of publicized bouts against British wrestlers, he brought with him the Greco-Roman institutions of titles and championship tournaments. But the big change came when a variant of Greco-Roman wrestling showed up in the US and the UK that allowed more and more varied kinds of grips and holds, including leg holds. This style, known as catch-as-catch-can, eventually further subdivided into the choreographed spectacle wrestling is known for today. It was in the United States where this became the most obvious and pronounced. Starting in the 1860s, wrestlers would travel with the largest circuses as part of athletic showcases promoted by carnies. Sometimes they would challenge the audience, but most of the time they competed in staged exhibitions with other wrestlers from other promoters, where they would dress in elabourate costumery and adopt fictional monikers and backgrounds. 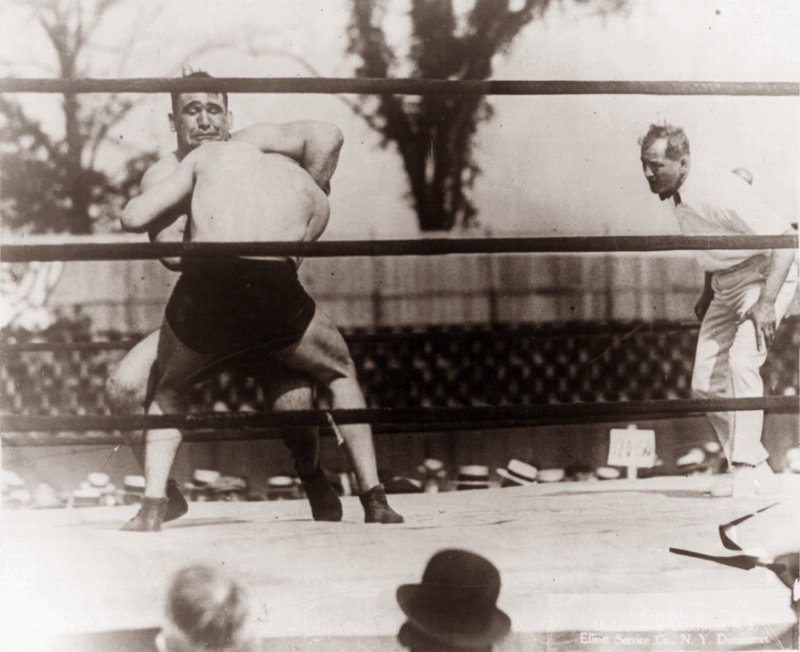 Some of these performers transcended the carnival to become proper stars in their own right, like Farmer Burns, a famous wrestler and trainer known for competing in over 6,000 matches and coaching other wrestling luminaries like Frank Gotch, who gained fame and notoriety for defeating Georg Hackenschmidt, making him one of the first world champions. Although professional wrestling waned throughout the 1910s and 1920s (curiously due to complaints about how fake it was), this period did see three major figures in the Gold Dust Trio: A joint promotion created by the wrestlers Ed Lewis, Billy Sandrow and Toots Mondt. The Gold Dust Trio introduced many new twists to the field that helped revitalize wrestling and would become mainstays, such as long-form storytelling (an innovation that was possible thanks to signing certain performers for years at a time instead of booking them on an individual basis), time limits, pretending to distract the referee to drum up drama and, most relevant to our purposes, tag-team matches. Ed "Strangler" Lewis and his signature headlock. The takeaway point here is, of course, that professional wrestling has always been drenched in theatricality and performativity. That is, ultimately, what it's always been, contrary to belief of some that there was some Golden Age in the long distant past where it was actually legit. Its origins are literally variety acts and circus sideshow attractions: It's been spectacle entertainment for as long as it's existed. Which also means that professional wrestling's union with television is, in retrospect, a self-evident and inevitable thing: Television has long walked a thin line between spectacle and theatre and, especially in the era we're now entering, can sometimes be seen trying to squeeze as much spectacle as possible out of a shoestring budget. And television *loved* professional wrestling as soon as it picked it up in the 1950s because it was a bunch of colourful stereotypes behaving in bite-sized, easy to digest tropish ways and was reassuringly cheap to produce. This also ties into how professional wrestling becomes so foundational to the pop culture climate we're entering (or actually to be more precise the one that evolves from the climate we're entering), because, at least in the United States, it can very easily be seen as soap operas for men. Although the alleged point of pro wrestling is an athletic showcase, the real draw, especially after decades of evolution and refinement, is the overall spectacle that comes from not just the actual wrestling, but the exaggerated, caricatured personalities and emotions that accompany the feuds and story arcs. Following professional wrestling for any period of time requires keeping track of a complex, convoluted network of stories (which in turn requires a massive time investment of the sort that attracts a very loyal and very niche audience), and characters can drop in and out of the narrative at any time, and can also flip from good to evil at the drop of a hat. Quite the build up just to cover that one time The Rock fought Seven of Nine. Oh wow, now we're getting into my area of expertise. Didn't expect this! I'm always ready to let Hulkamania run wild, BROTHER! I'll be sure to tear my shirt in half when I read it. Seriously, though, this is an exciting twist for me -- I've spent much of my life as a "student of the game" of professional wrestling, and I'm in the process of researching a major writing project on the subject .. so I can't wait to see you .... uh-hmm....grapple with it. Well, I'll try not to disappoint. I'm far from an expert on the subject myself, but I did as exhaustive an amount of research as I could under the time constraints I had to work under. Feel free to pitch in over the next few posts. And of course, I'll be anxious to see your reaction to the "main event"! I thought Jacob would like this. Wow - this is what I love about your blog, these seeming sideways steps. "Seeming" is the key word, isn't it (I hope)? Yeah for sure. The thing that really fascinates me about your journey is that as with a real trip into the wild heavens, apart from some key signposts I have no idea where you will be going! I am enjoying the surprises.